Make sure the iron supplement you take passed our tests and is right for you! Isn't your health worth it? Iron supplements can help to prevent and correct iron deficiency common in young women but also seen in children and among people taking drugs that reduce stomach acid. Iron supplementation may also reduce unexplained fatigue in women of child-bearing age, inhibit dry cough associated with ACE inhibitors, and reduce symptoms of restless legs syndrome in people with low ferritin levels. But choosing an iron supplement can be difficult: There are many different forms and doses of iron available, a wide range of prices, and some may be better manufactured than others. To help you choose the best iron supplement, ConsumerLab.com independently purchased, tested, and reviewed iron supplements. 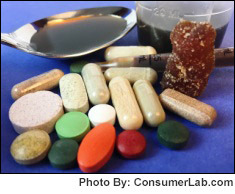 Our tests revealed that most iron supplements contained what they claimed. However, one iron supplement failed tests. Among products that were Approved in testing, ConsumerLab.com then carefully selected those providing the best form and value as its Top Picks. You must be a ConsumerLab.com member to get the full test results along with ConsumerLab.com's Top Picks and information on using iron. You'll get results for 22 supplements: 14 selected by ConsumerLab.com and eight that passed the same testing in CL's voluntary Quality Certification Program.